Over twenty thousand miles of highways and main streets crisscross the state of Connecticut, inviting hungry travelers and locals into the more than one hundred diners that dot the roadways. Among these eateries are some of the most prized American classic diners manufactured by such legendary builders as DeRaffele, O'Mahony, Tierney and Kullman. 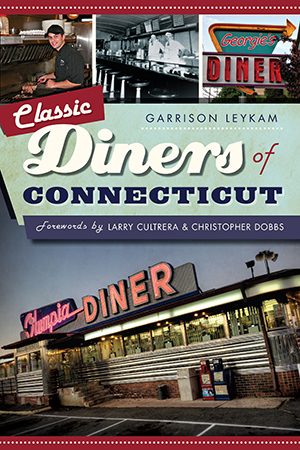 Author Garrison Leykam hosts a road trip to Connecticut's diners, celebrating local recipes and diner lingo--order up a #81, frog sticks or a Noah's boy with Murphy carrying a wreath--as well as stories that make each diner unique. Tony's Diner in Seymour still keeps pictures of the 1955 flood to always remember the tragedy the diner overcame. Stories like these--of tragedy, triumph, sanctuary, comfort and community--fill the pages in this celebration of classic and historic diners of the Nutmeg State. Garrison Leykam is recognized as a groundbreaker in reality TV as host and producer of the DINERS television show that aired on Connecticut Public Television (CPTV). He currently hosts the online radio program Those Diner and Motorcycle Guys which has garnered well over a million listeners in less than one year. Larry Cultrera is an archivist and photographer of the American roadside, specializing in documenting the American diner through his photographs. He is a long-time member of the Society for Commercial Archeology (SCA). Christopher Ian Dobbs has been in the history museum field for 20 years. He is currently the executive director of the Noah Webster House & West Hartford Historical Society, where he has revitalized the historic site through a successful capital campaign, new exhibits and expansion of programs that explore Webster's continued impact on America.